The Gardners were the royal family of Wayrest before every single one of them was carried off by the Knahaten Flu. Which is why the spacious and well-situated Gardner House feels like it's fit for a king! 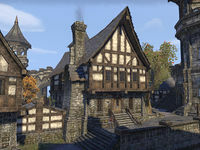 Gardner House is a large player house in Wayrest. The home has 3 entrances on the east, south, and west. The eastern entrance brings you into a small courtyard on the north side of the house which possesses a stable at the western end. The house has three spacious floors, a fireplace on the middle floor where all three entrances are and a large open basement. 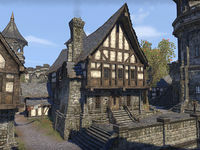 The house is conveniently located near the Wayrest Treasury to the south and the city's writ drop-off location, which includes Rolis Hlaalu, for dropping off Master Writs. 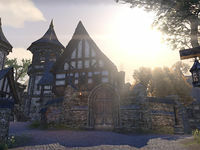 This house replaced Lemaitre Manor in Update 11.